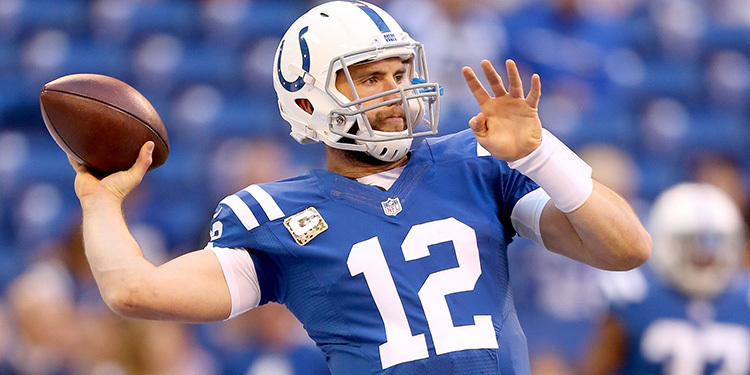 Mark's Tickets is the best place to find tickets for Indianapolis Colts fans. Just check this page for any new events or schedule updates throughout the year. We sell tickets to every Indianapolis Colts game around the world. We know how passionate Indianapolis Colts fans can be about football, so we make sure to have hundreds of tickets for every game available right up until it starts. For those looking for cheap Indianapolis Colts tickets, we offer tickets starting at very low prices (many times below face value). We offer tickets in most sections of every venue that you can see Indianapolis Colts. Simply choose the city or venue that you are interested in below, and you will be able to see all of the available seats. Do not forget that Marks Tickets also specializes in sold out Indianapolis Colts tickets. No longer will sold out shows prevent you from seeing Indianapolis Colts. The Indianapolis Colts are a professional football team that plays in the NFL. The Colts play their home games at Lucas Oil Stadium in Indianapolis, Indiana. With 16 games per year, and 8 being home games, The Indianapolis Colts are an American football team based in Indianapolis, Indiana; they play their games at Lucas Oil Stadium. The team is a member of the South Division of the American Football Conference (AFC) in the National Football League (NFL), technically being the only team in their division not located in the Southern United States. The team was officially founded as the Baltimore Colts in 1953 and were based in Baltimore, Maryland until the team relocated to Indianapolis in 1984. The Colts were members of the National Football League from their founding, however, they were one of three teams to switch to the AFC following the 1970 merger. While in Baltimore the team advanced to the postseason ten times and won three NFL Championship games in 1958, 1959 and 1968. The Colts had two Super Bowl appearances while in Baltimore, losing to the New York Jets in Super Bowl III, while defeating the Dallas Cowboys in Super Bowl V.
The Colts moved to Indianapolis in 1984 and have since appeared in the playoffs fourteen times, with two conference championships and one Super Bowl championship coming against the Chicago Bears in Super Bowl XLI. It was under quarterback Peyton Manning that the Colts saw their greatest success since relocating to Indianapolis, with the team appearing in the playoffs nine consecutive seasons, tying a league record.